With all the handwringing about the future of the mainline Church, Intersection went straight to the source. 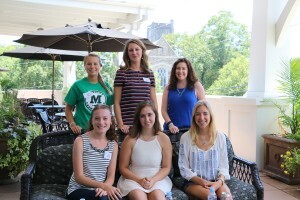 Assistant Director of Communications Melissa McGill gathered the summer interns at the Harris Teeter patio across the street for a wide-ranging conversation on their hopes and disappointments about the Church, and whether it can connect with a younger audience. 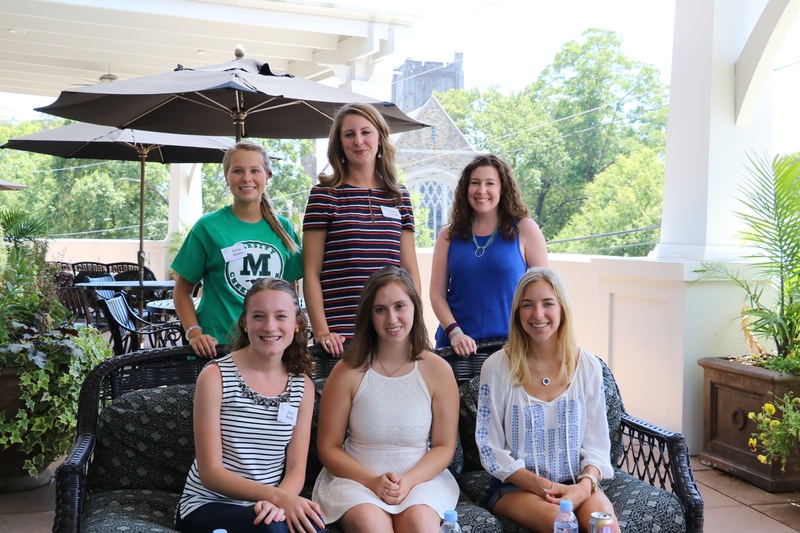 The interns included Emily Atkins, Janie Booth, Palmer Cantler, Caroline McKinley and Randi Smith. Melissa asked the questions. Caroline transcribed the tape. Church member Bill Walton took photos. Melissa: First what have your experiences in the church been so far; how did you get to this point? Janie: I grew up in this church from when I was baptized, to confirmation and mission trips. 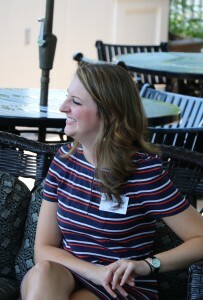 Some of my favorite memories have been doing mission trips and now, of course, working for Lauren. So I think coming up to this point is probably modeled after what my parents have done. It’s been cool to sort of grow up in the church and knowing a lot of people for a long time, and to travel, and now work for the church! Palmer: I’ve been a member of the Methodist Church my entire life. When I grew up my mom was the youth leader after I was born. I grew from being in a port-a-crib in her office to being confirmed in the Methodist Church. This is the fifth Methodist Church I’ve interned at, all different experiences and different sizes. The short answer is that I’m here because Duke sent me; I had no choice. The long answer is that I love the theology of the Methodist Church and the structure keeps us connected to not only to the congregation down the street but people across the country. …And that everything is decided on a larger scale rather than one congregation just deciding their views on things. Caroline: I didn’t grow up in this church but I was at the Presbyterian Church right across the way. I moved to our church and just loved doing mission work with Lauren and finding a small group that I’m still close with now. That’s cool because you sort of value those friendships more because you’ve created those relationships within the church, and it’s nice that you still have that group to touch back to. Emily: I also grew up in this church; my dad grew up in this church, so I’ve always considered church to be like family. I’ve been through confirmation and mission trips and all kinds of stuff in the youth department, which brings you closer together as a youth and also in church. I really value the things that we did to make not only church important, but also being a part of the community. Randi: I grew up in a church in Fort Mill and I’m the third generation in my family to attend church there. We’ve been there for a long time. I was baptized and confirmed there. I’ve seen it go through a lot of changes from a small 200-member congregation to 500-600 members, through changes in leadership. I’ve gone through a lot with them throughout the years. I’ve never considered myself personally Methodist until this past year. My family was but I wasn’t sure if that was exactly what I identified as. Then I went to college and tried out a lot of different denominations and realized that this really did feel right for me. 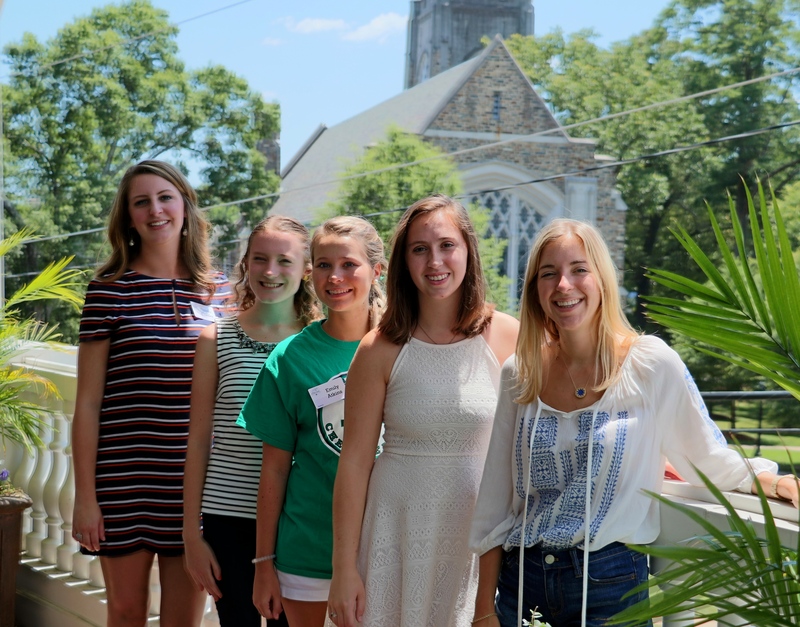 Melissa: Why did you decide to spend your summer here in ministry at Myers Park? Emily: I think it was comfortable. Starting an internship at a bank or an engineering firm, you are new to everything. We are so used to being a part of the church and knowing our way around that we fit into the internship. That’s how I felt; it just fit. Janie: I definitely agree. I’ve loved working with kids with our church through the C.H.A.M.P program and I have been fortunate enough to do that again coming back. Caroline: I think it’s a good spot to be. A good safe, homey kind of place to get a taste of the interny/business side of things. I think this is a really good place to start; to be grounded in something that’s bigger than a corporate internship. Randi: It’s probably the opposite for me. I chose this because it was uncomfortable. I know I want to go into mission work. I don’t necessarily know if I want to work in a church or not but I thought this was a cool way to get outside the church that I’ve always been a part of and see a different side of Methodism—this is so different than what I’m used to. I want to try and see all different sides of things. Melissa: Do you think you have a calling and what does that mean to you? Emily: I know that my calling is to work with children. I cannot think of a time where I didn’t want to be a teacher, which might have something to do with the fact that my sister is nine. I took over a mom role when she was born. You know how everyone has the baby doll they want to play with… well, mine was actually alive. And so I just took her under my wing and did everything with her. I would say that she’s my favorite person on this planet. I couldn’t think about doing anything else. Janie: I thought it was really eye opening to read the Callings book together as an intern group, about how a calling can mean a lot of different things and it has meant a lot of different things throughout history. So, I’m not sure where my calling lies, but I know it’s something to do with mission work or the church, or specifically just working with people. Randi: I know I’m being called into some kind of service or mission work, but right now I’m trying to discern whether that is supposed to be local or international missions. I’ve worked with both and I can’t tell which God is leading me towards right now so I’m trying to do it all until I get a clearer picture. Palmer: It’s interesting to hear you talking about how you are trying to discern your calling, knowing that four or five years ago that’s what I was trying to do. It’s been really kind of cool to look back and think, “Oh, I’ve had these thoughts and these questions too.” My calling is toward ordained ministry. I joke around saying I know I’m supposed to be in ministry when I’m sitting in class and start brainstorming sermon ideas. I have a whole note section on my computer so that when I think of an idea like, “Oh this would be great to tie in this movie,” I have a place to write it down. Last Sunday, I was able to lead worship and just the chills of being able to sitting up in the chancel. Once during the week, I went into the empty sanctuary and stood in the pulpit – I almost started crying. That’s where I’m supposed to be. Caroline: I’m still figuring it out. I think it’s something with journalism and it’s nice to have found this internship that combines the Church and journalism. I think it’s important that people know what’s going on in the community around them and where their money is going when they donate to the church. Transparency and the power of the media are really important, even in the church setting. Melissa: Where do you see the Church in the next 10 or 15 years? Palmer: The global church is going through a lot of problems right now, especially if you think about the Methodist Church and talking about homosexuality. However, how do we balance cultural difference with the doctrine that we hold, that everyone believes in. We all have this shared theology of grace, but how does that play out in a realistic context? I think the church is in this really weird stage of trying to figure out… also generational differences. The millennial generation is not as drawn to sit in a pew and be within the structured building of the church, whereas our older generations have. So what does that mean, as we are moving forward to churches becoming sitting on a barstool. I’ve seen some really cool things that people are doing; there was a church in Raleigh that has their main sanctuary like Myers Park does but they also have “church on Morgan” that serves as an art galley, they’ve had TED talks, and then on Sunday morning it becomes a worship space as well. The church is being reinvented as a different kind of community center, into one that reaches out more into the community rather than just trying to draw people in. I think as we are moving forward, I don’t know where I see the church in the next 5 to 10 years, but those are some of the things that we are trying to deal with and we need to be able to find the answers to those questions in order to not get stuck. Randi: Do you think that that’s any different than what the church has faced in the past with addressing cultural things? I see it as repetitive. Palmer: It is repetitive. It’s kind of a continuous re-interpretation and regeneration that’s almost cyclical. We’ve got to find the “new way” of doing church and we run into differences. Our generation is a little more excited, gung-ho, we want to do something different, whereas sometimes you run into a challenge with those who say, “This is the way we’ve always done it, and this is the way it should be.” It’s being able to find a balance between respecting church tradition and then also allowing the spirit to move in a very different direction. Randi: In Charleston, I go to church in a bar. It’s really fun. Our bartender actually came to Christ this year. She had grown up in the church and went through a really bad experience and had pretty much sworn it off for a couple of years. Then, she got put on the shift to work our church and after about two years of doing that she gave her life to Christ. She played the violin for us, and played the song that she played the last time she set foot in a church. So, cool things happen. Caroline: I’m not entirely sure but I think generational differences can cause roadblocks. With the changing of the guard in church leadership, things will change. I think our generation is more ready for change; more accepting. I think it’s going to be a journey, but I’m hopeful. Janie: It’s been really inspiring to be in a place like Duke to see how many people like Palmer want to go out and lead churches. That enthusiasm around the future of the church. Melissa: In the midst of all this change what do you hope remains? Emily: This is really specific but my absolute favorite part is the Christmas Eve service. Even people that don’t go to church all year; they will come to church on Christmas Eve. It brings people together. I still want that element of community coming together. Janie: That’s funny that you mentioned Christmas Eve, because that’s what came to mind for me too. My favorite hymn is “Little Town of Bethlehem” and it’s like, “the hopes and fears of all the years are met in thee tonight.” That’s probably my favorite line. That’s what speaks to me about why the church is so special. Palmer: I think the core, even more than specific traditions, is the idea of loving God and loving your neighbor. Loving God through worship, through study, through community and tying that into an outpouring of love to your community through missions. While the particulars of that always look a little bit different, having that core belief that, “We are a church because we have this common love for God and love for each other.” Seeing the manifestations of that change throughout the years; I think that’s the thing that I hope never changes. Randi: I think for me, I like to see a sense of unity in the church. I think that the Methodist Church specifically has done a good job of that. I’ve seen how other denominations have split over things that we have managed to unite over. You were talking about homosexuality earlier, and that’s something that there are crazy differences of opinion over but we are still the United Methodist Church together. Just recently Northern Ireland signed a treaty combining the Anglican and the Methodist Church. I am seeing a lot of really beautiful signs of unity and I hope that that continues. 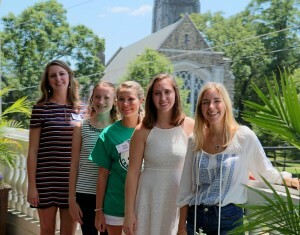 Caroline: I really have always loved going to, and being a part of the Love Feast that the youth lead every year. It’s cool to something that younger kids in the church can look forward to and see someone up at the pulpit and say, “When I’m older I want to read scripture.” It’s sort of a coming-of-age thing too, since they are seniors and they get to host the service. It’s awesome to hear a youth sermon and have a whole service lead by the youth. There’s always a ton of us that do it so it’s good for the parents to see that the kids here are involved too. Melissa: What do you believe is the truest purpose of the church? Emily: To bring a bunch of different people into the same place to worship God. Palmer: To love God and love our neighbor. Janie: I think it looks different at every church, what loving your God and loving our neighbors looks like. I think that for our church it’s unique that we doing all of these mission programs, we’re doing C.H.A.M.P and doing things like going into the community and doing Freedom School and things like that. At our church, that’s what it looks like. I know we’ve all had opportunities to go to different churches in college too, so it has been an interesting year to see that, and to see what our church does differently. Caroline: We’re a very affluent church. So, I think we are called to really use that in service of God. We learned a lot about that in the Callings book, about the different theories about the use of wealth for Godly purposes. As a body of Christ, I think it’s our responsibility to use our blessings to help others in Charlotte and with our missions across the world. Melissa: What gives you the greatest hope when thinking about the future of the church? Emily: The number of kids that showed up for Vacation Bible School—it’s a lot of kids. Their parents are making an effort to make God and the Church a part of their life starting so young. Palmer: For me it’s being in seminary and hearing talk about the death of “institutional church” and yet seeing so many people committing their lives and being so excited, and sitting down and planning these things and saying, “this is my dreams for the Church, this is what I’m called to and I will not reject that calling just because someone says the church is dying.” A good friend of mine is currently publishing a book that’s called “Stained Glass Millennial.” Instead of talking about all the millennial that are leaving the church, he’s writing about the ones who are staying. That was one of the questions is why commit your life to church so many are saying is dying? Why should I reject my calling because someone else thinks that the old way of doing things is done? So it’s a lot of how can we live into this new idea of church and have hope for it and also stand and say the church has suffered through persecutions and heresies for 2,000 years it’s not going to die just yet. That’s what gives me hope. The church has come through a lot; it’s not going to end because the Holy Spirit is moving in this place. Janie: I’m really inspired by the youth in this church. There’s so much in high school and middle school that could make you go away from the church and make you not come, and plenty of people in our grade haven’t come to church. But for the people that do, that stay, that want to go on the mission trips and want to be part of ministry; that really inspires me. Melissa: Is there anything about the church that disappoints you? Caroline: I feel like our church lacks diversity racially and socioeconomically. That has always bothered me because I feel like I wouldn’t want anyone to feel uncomfortable coming into a place of God; the church is supposed to be a safe place. Just like I wouldn’t want anyone to feel uncomfortable in our church, I wouldn’t want to feel uncomfortable going anywhere else either because we are all worshipping the same God. I hope that Charlotte as a city and everywhere can start to make some changes. Randi: Coming from Charleston I definitely agree with that. It’s been something that has been very heavy on my heart this year. I went to my orientation a week after the shooting last year. There shouldn’t be a white church and a black church, but there very much is. Palmer: One of the biggest culture shocks for me coming into Myers Park was that the church feels a little bit like an extension of the country club. Your membership in the church is so you can get married in that sanctuary. We all look the same, and I fit into that as an upper middle-class white woman. But, that’s not necessarily the church. If we are truly the church there should be more diversity in the pew. We should know the person next to us in the pew. I had a hard time walking in my first day because it was my first time in the church that I wasn’t being introduced. I wanted to leave in the middle of one of the services because no one talked to me. I had to invite myself to sit at someone’s table. That was very, very difficult. What does it mean to be the church if we are not actually communicating with our neighbors and making sure that people feel included and stepping up to the hospitality that we pride ourselves on. That’s a big disappointment I have specifically from Myers Park but then also for the church in general. We can’t be segregated because of our diversity issues. So what does it mean to worship together and how freeing could that be? Emily: It really surprises me that you said that, because I feel like our church is so close as a family. That’s sad for me to hear that someone wouldn’t come introduce themselves because I’ll walk around with my name tag and have 20 older people come up to me and say, “Oh, your grandfather is in my class!” Even after the services get out you have to weave your way through people in the lobby because so many people want to stay and catch up. Even at vacation Bible school drop off this morning we had to rip the kids away from their parents, because I mean, you can continue to keep talking but we have to start now. I feel like our church is really close-knit. I think that diversity as far as culture and ethnicity; that is based off the location of our church. Our church is in Myers Park. This is Myers Park. I think that that plays a big part of it. But I think that if someone came in that was of a different ethnicity or different race, they would still…or I would hope that they would be welcomed into our church. It is a place that we are all supposed to come and worship God. We are all the same in God’s eye and I think that’s what’s important. Randi: This goes for Myers Park and the church as a whole. I think that it’s not so much that it’s not being willing to open up to new people…If you see someone like Palmer it’s not that they’re not willing to go speak to you. I think there’s a little bit of embarrassment. You think, “I don’t know if they’re new, I don’t know if I’ve met them and I’m supposed to know them.” That can make it a little uncomfortable to go up and introduce yourself, especially with a large church. I think that most churches have that close-knit feeling that you’re talking about. I can definitely see that being a good and a bad thing. Because you do have that close family, but it’s harder to come in as an outsider and be let into that family. Caroline: I thought it was interesting that you said the extension of the country club thing. I’ve felt like that a little bit before here. I love this church obviously, and this not for people who come every Sunday, but a lot of the Christmas and Easter people come so that they can get a picture with their kids in front of the cross with the flowers. You know they are just going to post that on Facebook later so they can be like, “We went to church today,” but not the other 364 days of the year. That can be hard to see because you want them to stay for the right reasons. Palmer: It’s being able to picture the church as a commitment rather than just a two times a year. Going a regular basis because you see it as a priority. We should be in church. We should be worshiping God. Randi: I’m frustrated with the American church as a whole because we treat church like an extra-curricular activity, like it’s a nice thing to add. It’s like you said, “it’s a nice thing if we get to it and it makes us feel good,” but it’s not a deep-rooted need for God. Emily: Our culture now has such a need to be seen. Church has always been a personal thing. You go to church so that you can worship your God, whatever that is. Now it’s to go and take a picture in front of the flowers. Randi: It’s even worse in missions, because people do good just to feel good, and not because they are serving God I feel like we are doing a lot just to say that we have our hands on a bunch of different things not because God is calling us to serve and build a kingdom in a certain direction. Janie: That’s a hard question. We are also at a point of really big change in our church and it’s cool that we all get to be part of it. Hopefully these frustrations that are something that can all be addressed. Palmer: It is very disappointing to call ourselves the church and say that we doing something and not be living fully into it. I think it’s very disappointing, and it’s very hard. Melissa: The fact that you are being vocal about your disappointments helps to change it for the future. I think that’s a really important part of why we are having this conversation as well, to listen and hear what your experiences are and what you want to see but also to empower you to play an active role in the change you want to see. Actually what you just shared kind of surprised me because the trends in church attendance are going down. I’m hearing that presence is really important to you. Instead of going four times a month, people are coming like 1.7 times a month, I think that’s one of the numbers I heard. What are your thoughts on attendance? Janie: I think we are still having a lot of attendance with things that are labeled as ‘experiences;’ something that could have some sort of gain to you, like a mission trip or going on a really cool hike. We still have so much attendance with those. It’s more the ordinary, the everyday stuff; that’s where we are really struggling. Melissa: What challenges do you think the church faces in the coming years? Palmer: I had a business director describe it to me as the “death tsunami,” which is one of the most depressing things I’ve heard. It’s when all of the old givers in the church die and yes they might leave a memorial for the church but there goes their yearly tithe. Our generation—I’ll be honest—I don’t tithe, mostly because I don’t have a steady income. You are supposed to want to give freely but when you are living paycheck to paycheck it is very difficult to say, “Yes, I want to give God ten percent,” but I can’t because then I won’t make my rent payment. That’s a really big challenge for the “big C church.” We have these things that we want to do and these ministries, and people we want to support but we are not giving everything of ourselves. Maybe we are giving of ourselves time-wise but not monetarily. How do you find a balance between the two so that your budget actually reflects your priorities? Emily: Also some people say, “Oh yeah I donated, there is my contribution to the church. Oh the flowers this morning, oh I bought those.” That’s nice and all but that’s not a contribution. That looks nice but..it makes you look good, but it’s not like donating your time. All the people from vacation Bible school are volunteers. Sure we may have had to say, “Hey do you want to volunteer for vacation bible school?” but they still put in the time. I think that looks so much better than writing a check. Randi: We need a balance between it. The money—we need it—we can’t just write that off. But what you put into it is important too. It’s very easy to lean towards one side of the scale and not focus on both. I’m guilty of that. I’ll volunteer all day long, but I never have money to give. I say that; I could. I just don’t make that priority. Caroline: I think another challenge that we are going to face, and that I feel like we are currently facing is public figures who are claiming Christianity who aren’t reflecting the true beliefs of the church. Political figures that are claiming to be Christian aren’t really living out things such as reconciliation and grace and love and acceptance that are so central to the church. It’s hard for people who aren’t Christian to see that and see these people calling themselves Christian and then seeing the disconnect and wondering, “Well is this what Christianity is?” It put us in a hard position because you don’t want people to align the church with that. At the same time some of these people are so visible that people will see it and think that’s something that…I don’t know how we are going to address it. Emily: That applies globally too. There are so may people who are seen across the whole world. You hear a certain name and you’re automatically like EWW. And there’s nothing that I think we can do about that because I think that’s personal. We can’t tell someone to go change. I definitely agree that if a certain person is saying that they are Christian, they are shaping the reputation of what it is to be a Christian. That’s frustrating. Janie: I think it’s easy to say that these are new challenges, but we’ve learned a lot in our Callings book about how these challenges have arisen from the year 100 when the church was starting. Maybe we too easily think that we have to solve it on our own, but a lot of the answers are in the Bible and in the Holy Scripture. Living that out and balancing that with what we are facing daily is really important. Melissa: Do you think the church is relevant to your generation in the world today and why or why not? Randi: I’ve never understood this question. I’ve been asked this so many times and it just doesn’t make sense to me. Emily: I think the obvious answer is yes but I think not as much today as it should be. Janie: I would even say the church is more relevant today because of the fact that there is so much hate going around the world that it’s more important than it ever has been, to people of our generation especially. Caroline: I think a lot people in our generation see it as irrelevant, but I think they need it more than they think they do. Especially since the shooting in Orlando this week, everyone has been distraught and sad. Obviously, everybody’s wondering “where do we go from here;” there is a lot of confusion. But I was so helped and calmed by Melanie’s sermon on Sunday. I’ve been talking to my friends about it all week and I wish that they had been there. I don’t think that people in our generation think, “Maybe I can find the answer to this in the sanctuary.” I think that they can. Palmer: It’s not as relevant as it used to be in terms of changing public opinion and being an advocate for change, which is kind of disheartening. Martin Luther King Jr. was a minister and all of the change and political energy that came from an ordained person. Now, when a Bishop says something it doesn’t necessarily mean anything is going to happen. On a more spiritual scale, the church has to be relevant. We are generation of spiritual but not religious. Being able to show as members of the church that those don’t have to go separately. Religion is often defined as this oppressive force and we have to live within these rules, and so spiritual is kind of being able to float around and choose what beliefs I have. But, the church is not a force of hate. And the church is not trying to shut out other people. 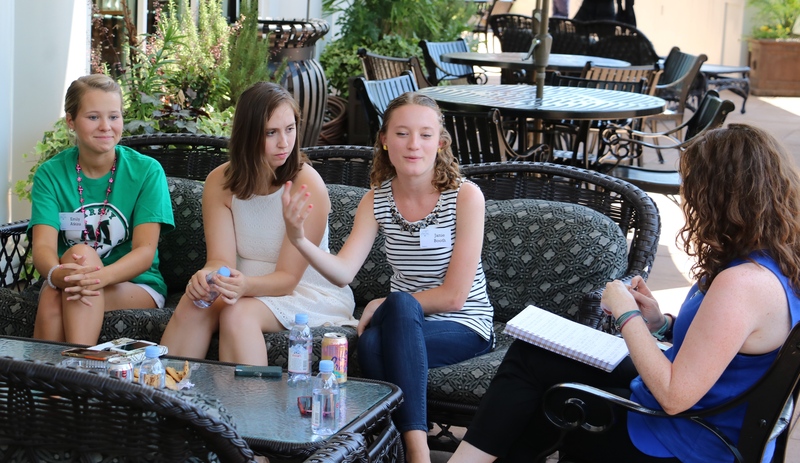 How are we as millennials trying to show other millennials that yes, being in church does mean you can be spiritual and it does not mean that you are going to be a part of this organization that is hurting other people because we do not want to hurt other people and that is not our mission. Melissa: I would like to circle back to Randi and find out more about your thoughts on the question. Randi: I’ve just been asked this question several times and it just doesn’t make sense to me because if you ask if the church is relevant…It doesn’t matter if it’s relevant or not, it’s gospel and that’s what we need to focus on. We need to make it relevant. Melissa: How you think that as the church we can make sure that the gospel is relevant to the people around us? Randi: I think the fact that we make it an extracurricular and we preach prosperity gospel makes it irrelevant. Then you can take it or leave it. It’s relevant if eternity rides on it. If there is one God that created everything and that you are created to worship, that’s pretty relevant. It’s the way that you deliver the message and I don’t think we are doing a good job of it. Janie: I think delivering the message was what I was going to say. I remember being teased for having the translated version of the Bible, The Message. In my college small group I pulled mine out and people laughed at how different it is, but to me that is one of the ways that helps me the understand it better. We can be relevant in terms of translating the message; our job is actually translating the message. If that means to elementary schoolers or to youth. I think constantly doing that and being aware of how and what we are using to share and translate and mediate the message of God. It’s really more important than it’s ever been. Melissa: How do you think the church can play a vital role in people’s lives? Palmer: I have a bit of a problem with that question. Mostly because it’s not supposed to be the church doing something for you, but you working for the good of the church. The church is not a brick and mortar building, or a paper that you sign that your membership is there; the church is us living out God’s mission in the world. Asking what can the church do for people really bothers me. It’s not what I can do for you as a staff member, as an intern, or as member of the church but how we can work together in a community to work for the betterment of ourselves, of the world, and especially of our local community and our local area. 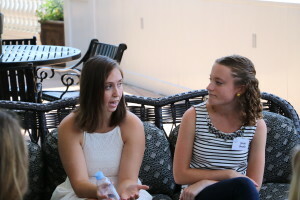 Melissa: So what I’m hearing out of that is that the church should be a connector. Connecting people to God and to the community. Randi: I think the church becomes more vital to individuals the less it does, if that makes sense. I don’t think that we should necessarily expect people to be doing activities every single day at the church and constantly be there. It shouldn’t be like you don’t have a social life and you don’t have a purpose if you’re not at the church. I think it’s more vital when it is that connection. Janie: My favorite line is, “How can we be a church without walls?” That’s something that goes so much further and deeper and far way from this place and still be God’s people and still be recognizable as Christians even when we are not in a particular building. Caroline: I like the contemplative prayers we have been doing with Melanie. I think that could be something we could integrate. A lot of times the church can be a space that has so much going on. Since the outside world is so fast paced sometimes the church needs to be a place where people can slow down, come to think and put your phone away for an hour or so and sit and be silent. How are you supposed to be able to hear God if you are always talking and moving? Janie: I love that she calls it a practice. I think about myself practicing guitar, but you don’t really think about yourself practicing being a Christian in that way. She talks about doing yoga as a practice but also the Ignatian Examen that we did last week. It was really eye opening to think about how we can do that everyday in a way of practicing being a Christian. Melissa: What do you see as your role in the Church’s future? Caroline: I think I’m supposed to push people’s buttons a little bit. You don’t have to be comfortable all the time. Some of the most valuable experiences come out of being a little bit uncomfortable. I think people need to be more open to trying new things. I love to try new things, explore new places and meet new people. I think that that’s something that I can bring to the church. 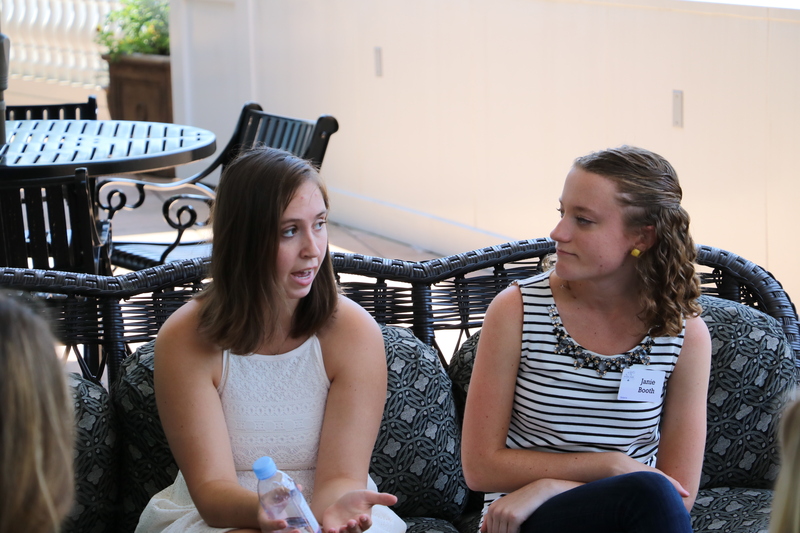 Janie: I think definitely the biggest focus of college is “finding yourself,” and finding your role in life. I too often forget that finding your role in the church will also help that, no matter what it is. It’s not really one or the other; your role in the church or your role in life. It’s sort of how they can coexist. I don’t exactly what it will look like for me, but I know that the church is something that I want to be part of for the rest of my life, whether as a job or as spiritual…who knows. It’s sort of a crazy time right now to be figuring it out, but this definitely matters a lot. Palmer: Thank you for giving me time to think, because I don’t know. I know my goals for myself, I know my career goals, and I know my friend’s career goals for me. They keep saying, “Palmer’s going to be a Bishop,” and that’s terrifying. Please don’t ever wish that upon me. My goals for the church…. For us to grow and worship so that it becomes so much a part of our daily life, so that you don’t even realize that you are constantly worshiping. When you driving down the street and notice how pretty everything is outside your window, you realize that is an act of prayer and worship, and recognition of God’s work in the world. For us not to be complacent in the way things are but to let the spirit be in control, and for the church to be a part of that instead of what so often happens, which is restricting. Restricting the spirit because we say, “Well this is way we’ve done things,” or, “Our means are only so much.” But to be able to figure out ways to kind of challenge that and say, “How are we following the Holy Spirit instead of standing in her way?” The Spirit is a her. What’s happening right now is very cool. The church is not a brick and mortar building, it is a bar. Just the different things that we are re-imagining a lot of what church means. What does membership in the church mean as membership is falling? I think it’s hard to make an explicit goal knowing that there is a lot of transition, and almost a new reformation happening. Melissa: What do you see as your role in that? Palmer: I just want to be a part of it. I don’t know how. I hope that I don’t stand in its way. I want to be a part of it and want to be a part of the energy. There’s such a thrill to be able to say that this something that God has ordained, that God has set forward for us, and to be a part of that and to be able to move with the energy of it. Melissa: Palmer, I’m going to ask if you can pray us out. Palmer: Almighty and most gracious God, thank you for these conversations. Ones in which we allow your spirit to move within us and to ignite our hearts with passion and inspiration and creativity for all the possibilities of your church in this world. We ask for our dreams, with your help and your will, to one day come into fruition. That we might not be complacent or be part of a church that is recognized as dying or segregated but one that is full of diversity, and life and wonder in this world. I ask for your blessing upon all of these women gathered here, that they have such wonderful gifts to offer to the church, that you might continue to give them opportunities and loads of possibilities that they will be able to serve you. All in Jesus’ name I pray. Amen.